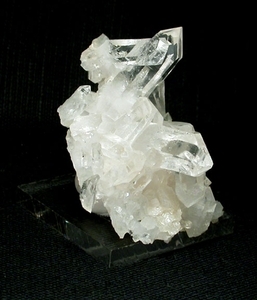 A Grade A Arkansas rock crystal plate cluster, small cabinet sized, features a NINE-faced Really Rare Double Isis Point penetrated with a fine tabular crystal. Exceptionally clear. One fleabite, one missing crystal in regrowth: no damage. Several uncommon 7h faced points, recordkeepers and assorted rainbows. 2x 2-7/8x 1-5/8" tall from glittering its' plate bottom, and self-displays beautifully from all sides.